A scientist and a writer, Andrea Rothman knows more than a thing or two about smell. 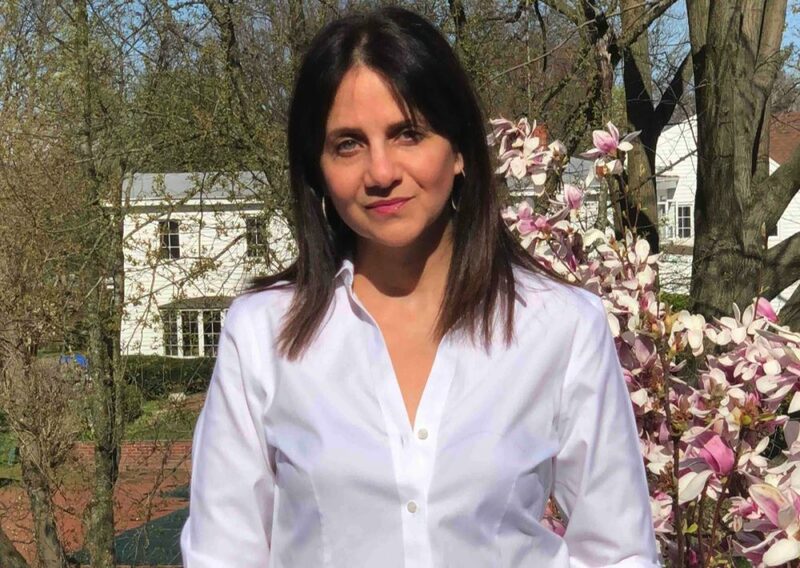 She was a postdoctoral fellow and research associate at the Rockefeller University in New York, where she won two individual grants from the National Institute of Health to study the neurobiology of olfaction. She went on to earn her MFA in Writing from Vermont College of Fine Arts, and served as our very own Assistant Fiction Editor here at Hunger Mountain for five years. 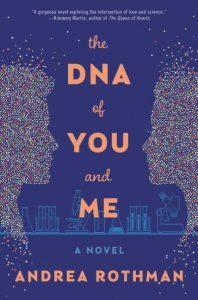 It was my great pleasure to chat with her about her debut novel, The DNA of You and Me (William Morrow, March 2019).We talked about women in the sciences, smell as metaphor, and much more! You come from a scientific background of studying the sense of smell. How did you first get the inspiration to write a book about this topic, and a fictional novel at that? The neurobiology of smell is a fascinating topic, but that’s not what my novel is really about. The science of the novel frames the story and serves as a metaphor for the larger themes, which are mainly choice and identity: the choices people are faced with at key moments in their life, and who they are at the time. It takes a lot of self-knowledge to choose wisely, and many people, especially young ambitious people starting out in their careers, don’t know themselves well enough. Even if they did, who is to say in the long run that the best road was taken, or that a better destination did not exist? The science behind the sense of smell lends itself metaphorically to this kind of story because what makes smell possible is that sensory nerves from the nose need to reach and connect with particular targets in the brain. During the journey to those targets, the neurons are aided by guidance cues that hem them in their path towards the final destination. The story’s protagonist, Emily Apell, who is at a crossroads in her life, discovers a new guidance molecule, and coins it Pathfinder, which incidentally was also the original title of my novel. In the Author’s Note, you mention that the research projects and findings in The DNA of You and Me are fictional, but are based on established scientific principles and other examples. What was the research process like for you? Because I have a background in science and worked for many years in olfaction, this aspect of the research was relatively straightforward. The more difficult part was tying together all of the scientific knowns and unknowns in a coherent fashion and coming up with an important scientific question and a plausible research project for Emily: mainly, is there a new and, as yet, undiscovered family of guidance molecules out there, specific to the sense of smell? This question (and its plausibility) required some extensive reading on existing axon guidance families and their role in olfaction. Because the novel is set in 2003, most of the scientific papers I probed are from that period. In addition, I also did some extensive research on Anosmia, defined as a total or partial loss of the sense of smell, and read the memoir Season To Taste: How I Lost My Sense of Smell and Found My Way by Molly Birnbaum. Another book I read that helped me write about the sense of smell was the novel Perfume by Patrick Suskind. Was there anything you learned about olfaction that surprised you, or that you hadn’t thought about until writing this novel? Until I wrote The DNA of You and Me, I had never appreciated the significance of our fifth sense. Most people believe that smell is important because it enables them to smell the roses, perceive flavors, and avoid rotten food or a potential fire, but this is just the tip of the iceberg. In reality, because of the way olfactory neurons are wired in the brain, our sense of smell is our strongest, most faithful portal to the past. Smells can trigger the recollection of autobiographical memories in a way that none of our other senses can. It’s little wonder that Proust’s madeleine-dipped-in-lemon-blossom-tea passage from Remembrance of Things Past is so ageless and also so steadfastly true to the human condition. You deftly weave hard scientific language with the dreamy lyricism that describes the feeling of falling in love. How did you achieve this balance of seemingly disparate dictions? I think the balance you describe is achieved through the use of science elements that resonate with Emily’s formative years and with her state of desire at different stages in the novel, in particular during her time in Justin’s lab. Describing the database of the lab for instance, and the gene she hopes to find, Emily equates finding the would-be gene to finding a bird in a forest. Birds, the reader discovers several chapters later, symbolize truth and hope for Emily. The importance of the gene she eventually finds in the database rests in a sequence deep in the DNA strand of the gene that contains mirror repeat letters. It’s kind of like a palindromic word that reads the same backwards and forwards, MADAM, but with the 4-letter DNA alphabet instead: …ACTGC:CGTCA… Emily envisions the mirror-image sequence as two halves of a bridge, which resonates with her desire to connect with other people, in particular Aeden in the lab. The contrast between who Emily is as a person and what she hopes to achieve in her personal life is what drives the forward movement of the story and defines the urgency of the voice in the novel. In the novel, Emily must choose between her love for Aeden and her love for her scientific work. This need to make a choice between work and love is a deeply-rooted historical (and I think, problematic) issue for women, perhaps no matter the field of study. While I do believe this attitude is changing, can you talk a little more about this pressure put on female scientists specifically? And what has been your own experience as a woman in the lab? While I agree that this gender-biased attitude in disfavor of women is changing in many highly competitive careers, including sports and politics, I also think that science and STEM-related fields have been slow to catch up with the trend. The leaky pipeline is all too real; while most students pursuing a PhD in science are females, most people who end up actually staying in academia and having leading roles in science research are males. This is due in part to old school biases and expectations passed down from an era when the scientific workforce in the lab was predominantly male. Early-career scientists, leading up to a faculty position, are expected to work at minimum sixty-hour weeks, which runs contrary to being a mother and having a family. If this weren’t the case, I might not be writing these words right now. I am one of those women who left a career in science after I realized that being a working scientist and a mother would be too difficult. In the end, it’s a personal choice. There are plenty of women scientists who run research labs and have young children at home, but the fact that there are so few in relation to men speaks volumes. I think what needs to change in order to help women stay in science is mainly the culture of science. Taking time off for family care should be viewed as a normal and acceptable part of the science career path, and funding policies from both private and public sectors should run in favor of this view. I think what helped me as a writer to describe smell is being in touch with the state of the main character’s desire. I needed to understand who the protagonist is and what she wants, and then infer from this how she would perceive a particular smell at any given moment in the narrative. For instance, in Chapter Two, when Emily is recalling her father and their home in Rockford, Illinois, she describes the smell of laundry detergent as clean and comforting. Many chapters later, after a brief sexual encounter with Aeden in the lab, Emily describes the smell of his shirt as having the smell of sea breeze, which is a more ephemeral and dreamy way of describing the same thing. When trying to find words to describe a particular smell, it also helps me as a writer to break down the source of the odor into its essential components, so as to better understand where it’s actually coming from. For example, I learned that grass, when it is cut, exudes volatile organic compounds, known as distress signals. The idea of a freshly mown lawn therefore is suffused with trauma, but also with resilience; hence the “sweet iron odor” of a sheared lawn. A delicious smell? Undoubtedly, the smell of ground coffee beans! A nostalgic smell? The smell of the pages of an old book that hasn’t been opened in a while. The worst smell ever? The smell of a mouse room in the lab after a long weekend. Fortunately, most people never come across this smell, but as a former research scientist, I did much too often. Learn more about Andrea Rothman at andrearothman.com, or on Twitter @rothmaa.